Rofin Australia Pty Ltd was established in 1978 as a Scientific Instrument marketing company. In 1988 the company developed its own range of products which it currently markets worldwide. With its corporate office and production facility located in Melbourne, the company uses optical technology to develop and market specialist products, systems and analytical instruments. Market sectors include industry, government, police, and research laboratories. The company is involved in both import and export, with over 90% of its turnover coming from the sale of instruments developed and manufactured by Rofin. The Forensic Division of Rofin Australia Pty Ltd is particularly well known for its range of forensic science instruments. These include the cost effective PL400 with up to 20 bands; the Poliview® image capture and enhancement system; and the Polilight® PL500 which is recognised as the pre-eminent forensic light source for detecting fingerprints, document fraud, body fluids and other trace evidence. More recently, the introduction of the Polilight FLARE PLUS and FLARE PLUS 2 has widened the range of forensic light sources. These LED based light sources are specifically aimed for use at scene of crime. Rofin's range of forensic instruments is used at more than 3,000 locations in 77 countries worldwide by leading agencies such as the FBI, CIA, Scotland Yard, Bundeskriminalamt, Japan National Police and the Australian Federal Police. In 2005, the export achievements of Rofin Australia Pty Ltd were recognized by way of the Australian Export Awards (AEA). The Company’s extensive involvement over a period of 23 years in the forensic sciences has resulted in the establishment of many valuable associations in Australia and around the world. 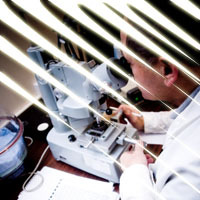 In Australia, a good working relationship exists with the forensic laboratories in Victoria, South Australia, New South Wales, Western Australia and the Australian Federal Police. These ties have provided Rofin Australia Pty Ltd with the technical and training background to enable the installation of a number of successful Forensic Science Laboratories around the world. These have included DNA and Fingerprint Laboratories in Vietnam as well as one of the largest forensics laboratories in Malaysia. Rofin’s light sources have not been limited to criminal forensic applications. Art galleries have used these light sources as a diagnostic tool for more than a decade. Applications include the minute examination of the surface of paintings and other art works in order to assess treatment they might need for conservation purposes. Rofin light sources have also been used to assist with the accurate identification of paintings. Rofin Australia also manufactures a range of products through its Light Guide Division. 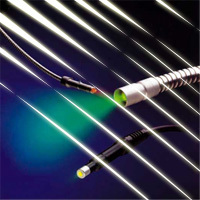 Rofin's polymer and liquid light guides are used for the transmission of light in a wide variety of industries and applications, including lighting, dentistry, UV curing, signage, endoscopy and solar power. In addition to manufacturing, Rofin also designs a broad range of liquid light guides to meet the ever increasing diversity of customer applications for high energy light transmission. A highlight of this range of products was the completion, in conjunction with Poly Optics Australia Pty Ltd, of the 130,000-metre, 12,000-points of light, feature lighting system installed in the Cheung Kong Centre, Hong Kong. The common thread linking Rofin's Divisions and the majority of its extensive product range is optics technology, optical analysis and instrumentation. One of Rofin's key successes has been its ability to integrate its extensive expertise in optics, electronics and software to develop innovative new solutions in the marketplace. Its multidisciplinary team and its flexible working style have allowed it to develop unique and unusual solutions to existing markets and to successfully penetrate new markets. This process has been greatly assisted by its close working relationship with a large number of leading Australian Universities or Institution Laboratories and its ability to combine academic R&D with commercial priorities and requirements. Since its inception, Rofin has had an unerring commitment to quality and service. Rofin Australia is proud of this pedigree as it has seen many satisfied customers extol the Company's good reputation. Going forward, these components underpin Rofin’s period of rapid expansion. Another strong component is the Company’s willingness to develop specific solutions in order to satisfy customer requirements. Research and development has led to continued improvements in the products and systems that Rofin offers which is expertly supported by a team of highly qualified and highly trained service engineers. The company employs staff in sales, marketing, R&D, production, technical support, and administration. Rofin is based in Melbourne, with US office and agents in over 20 countries around the world.